A corollary, from slide 19 here, is that (when your type system supports richer types) a boolean type is almost always the wrong choice, as it carries too little information. The name “Boolean blindness” for this seems to have been coined by Dan Licata when taught a course at CMU as a PhD student. There is no information carried by a Boolean beyond its value, and that’s the rub. As Conor McBride puts it, to make use of a Boolean you have to know its provenance so that you can know what it means. Keeping track of this information (or attempting to recover it using any number of program analysis techniques) is notoriously difficult. The only thing you can do with a bit is to branch on it, and pretty soon you’re lost in a thicket of if-then-else’s, and you lose track of what’s what. No Boolean necessary, and the code is improved as well! In particular, we obtain the predecessor en passant, and have no need to keep track of the provenance of any bit. To the best of my knowledge, Ted Codd was the first to point out, in his relational model, that there is no place for Boolean data types in entity modeling. It is a basic design principle to avoid characterizing data in terms of Boolean values, since there is usually some other piece of information you are forgetting to model, and once you slam a Boolean into your overall data model, it becomes very hard to version towards a more exact model (information loss). Basically, the idea is that when you branch on a conditional, information is gained. This information may be represented in the type system and used by the compiler to verify safety, or it can be ignored. If it is ignored, the language is said to have “boolean blindness”. In branch a and branch b, different invariants about ptr hold. But the language/compiler are not verifying any of these invariants. This defines a type “Maybe”, parameterized by a type variable “a”, and it defines two “data constructors” that can make a Maybe value: “Nothing” which contains nothing, and “Just” which contains a value of type “a” inside it. This is known as a “sum” type, because the possible values of the type are the sum of all data constructor values. .. use fromJust mx .. -- UNSAFE! .. can't use content of mx ..
Just x -> ... "x" of type "a" is now available in our scope! So when we branch on the two possible cases for the “mx” type, we gain new type information that gets put into our scope. “Maybe” is of course a simple example, but this is also applicable for any sum type at all. A nullable pointer has two ‘parts’: null, and all-other-values. These can be got at with a simple if-else conditional: if p is not null then ... else ... end. And there is still nothing wrong with that. The problem arrives when you want to handle the parts – and you lack a good type system. What do you do with the non-null pointer value? You just have to put it back into a pointer again – a nullable pointer: which is what you started with. So where has what you did with the test been captured? Nowhere. When you handle that intended part elsewhere you have to do the test again and again. Not strongly typed, richly typed. Where evidence isn’t thrown away. Agda is about the closest thing to this we have. Here instanceof returns a boolean (comment (1)), but doesn’t carry with it any information about what that boolean represents (namely that x is an instance of Succ) so when we get to the next line (2) we’re forced to do an unsafe cast. As programmers, we know it’s safe from context, but the compiler doesn’t. There’s a rub though — in your first code snippet, “plus” was written as a non-member function; anyone can write it as a stand alone library. It was modular. But, as you demonstrated, it had the redundant type check. However, your second code snippet has lost this modularity. You had to add new methods to the Num data type. I think this is the pitfall of Object-Oriented Programming (which is like “Pants-Oriented Clothing”): objects can talk about themselves, but it’s harder to talk about objects. If you want to write a function that does similar things for a bunch of types, you have to write similar function definitions in all those different classes. These function definitions do not stay together, so there is no way of knowing or ensuring that they are similar. E.g. there is no such thing as a “method” in C++. As far as the C++ standard is concerned, functions inside classes are always called “member functions”. 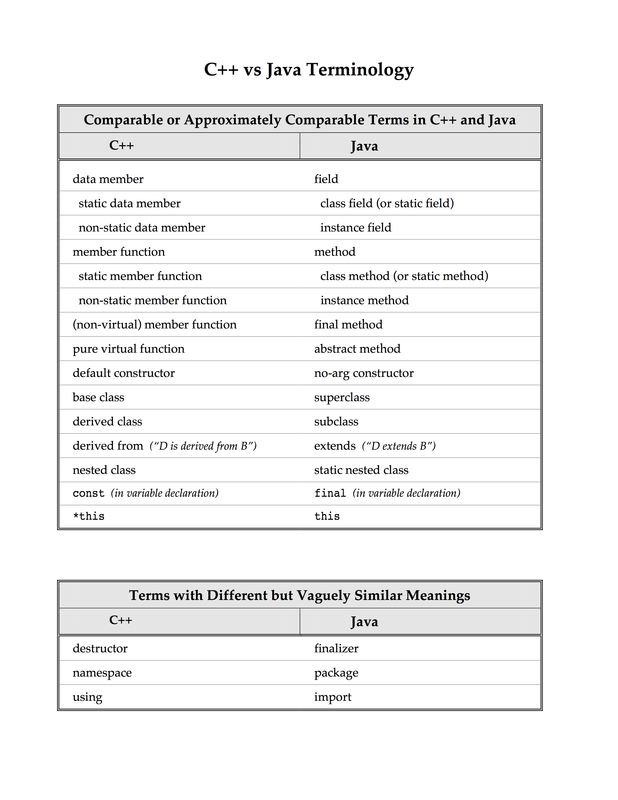 Here is a handout from this course (taught by, AFAICT, Jeffrey S. Leon) that helps me understand the Java people.